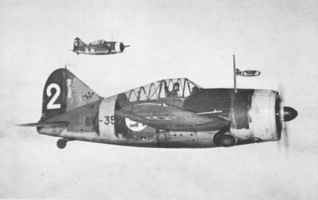 Version initiale du F2A Buffalo. 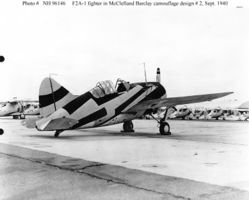 Un total de 11 avions de cette variante ont été construits pour l'US Navy. 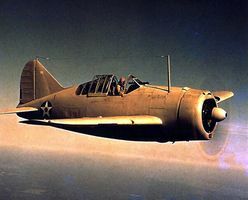 Service testing of the XF2A-1 prototype began in January 1938 and in June, production started on the F2A-1. 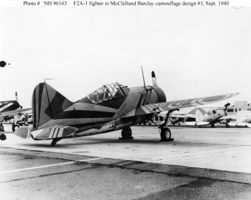 They were powered by the 940 hp (701 kW) Wright R-1820-34 engine and had a larger fin. 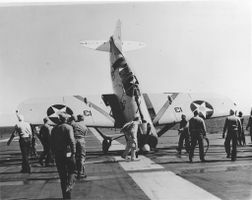 The added weight of two additional .50 in (12.7 mm) Browning wing guns and other equipment specified by the Navy for combat operations reduced the initial rate of climb to 2,600 ft/min. 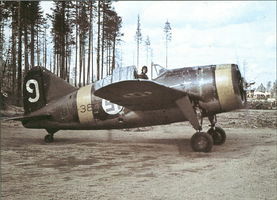 Plagued by production difficulties, Brewster delivered only 11 F2A-1 aircraft to the Navy; the remaining 44 were later diverted to the Finnish Air Force in modified form under the export designation Model 239.